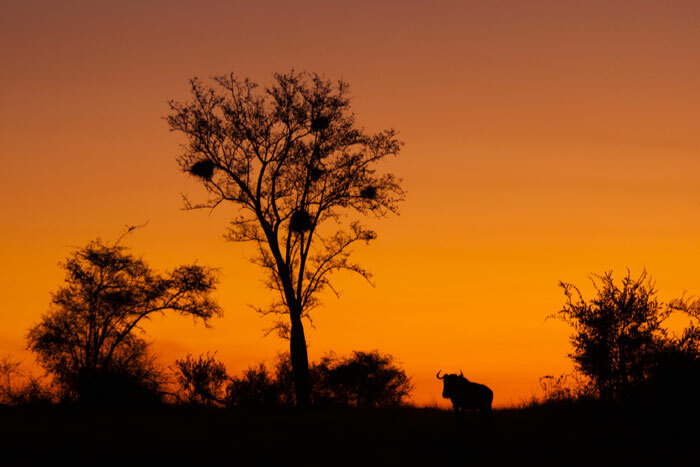 The sun sets over Circuit North, silhouetting a wildebeest and the buffalo weaver nests. I must give artistic credit for this photo to our guest Vipul Tuli, who asked us to stop so he could take the photo for himself! The Marthly Male turns from drinking after feasting on a zebra foal carcass. 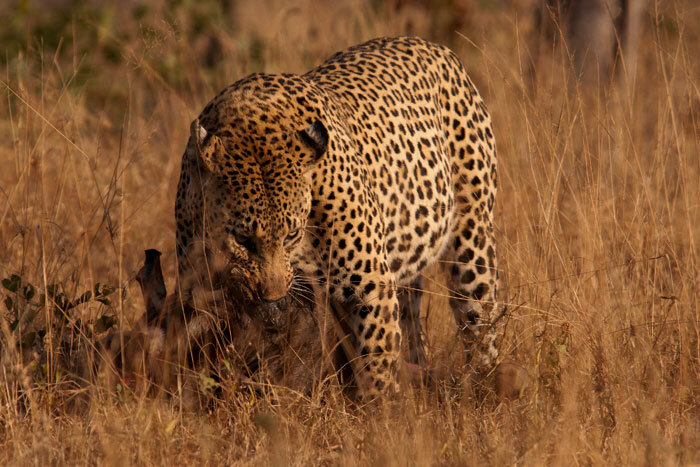 A zebra – even a young one – is a big catch for a leopard. 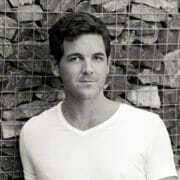 The Marthly Male was far away from his usual realm – deep in the heart of Camp Pan’s territory. 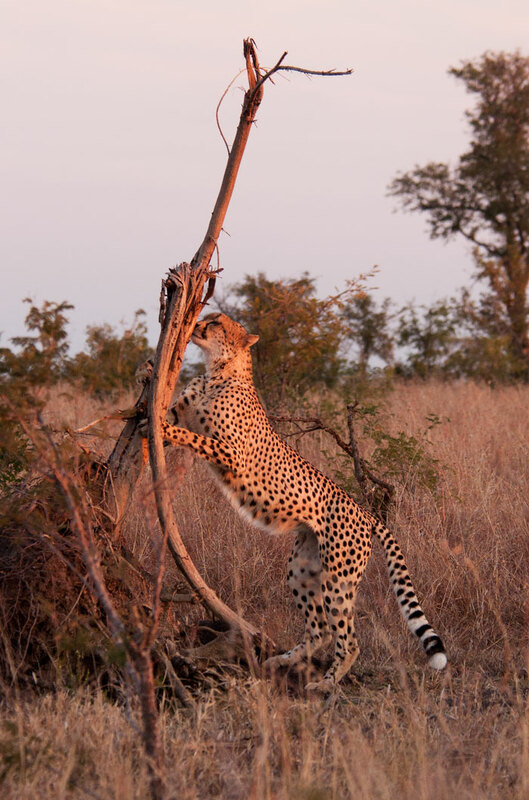 Aside from chasing the Maxabene 3:2 Young Male into a tree one night, his presence seemed to go unnoticed while he spent three days on the kill. 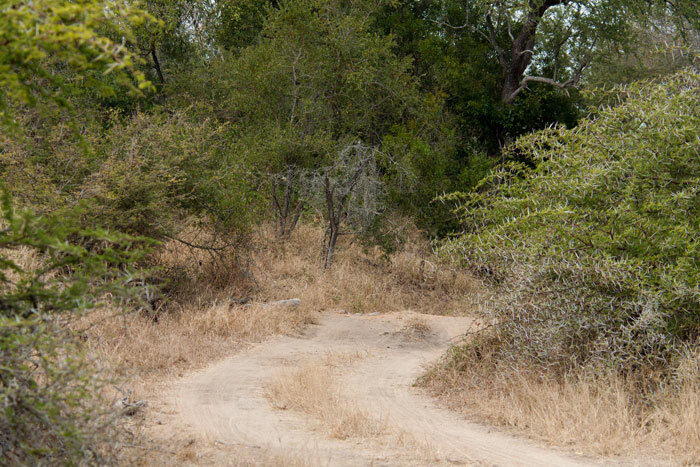 Can you spot the leopard? 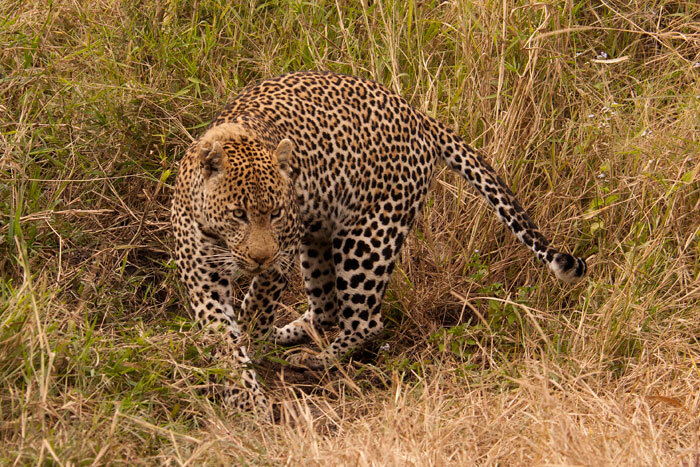 The Marthly Male then went and laid down, highlighting how difficult it can be to spot a leopard even closeby! 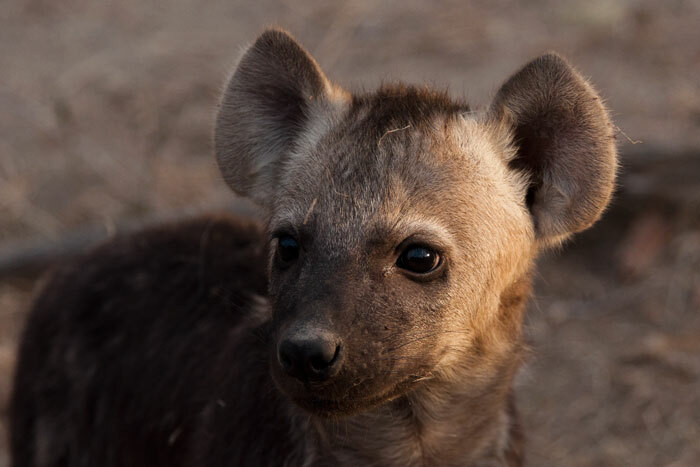 He is to the left of the road, under the horizontal branch – you can see the black spots of his ears. 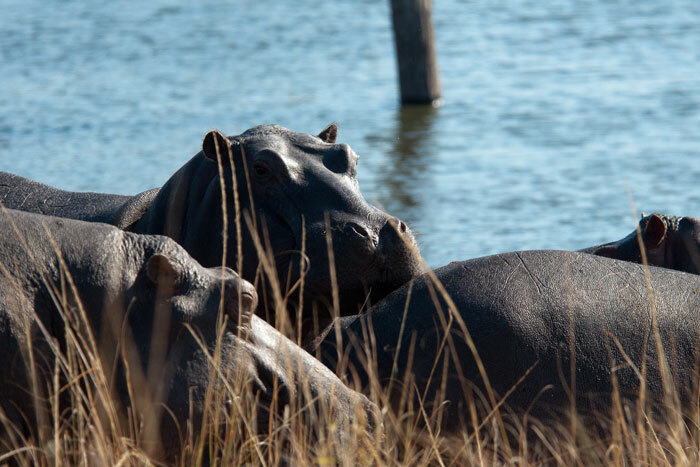 Hippos sunbathe outside of the water at Ronnie’s Dam. 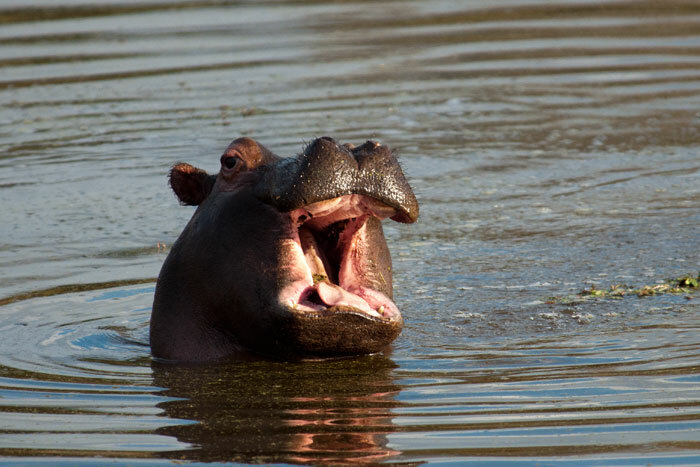 it surprised me how close they allowed the vehicle to come, as usually hippos feel insecure on land and flee into the water with any disturbance. Every sunrise is stunning in the winter! 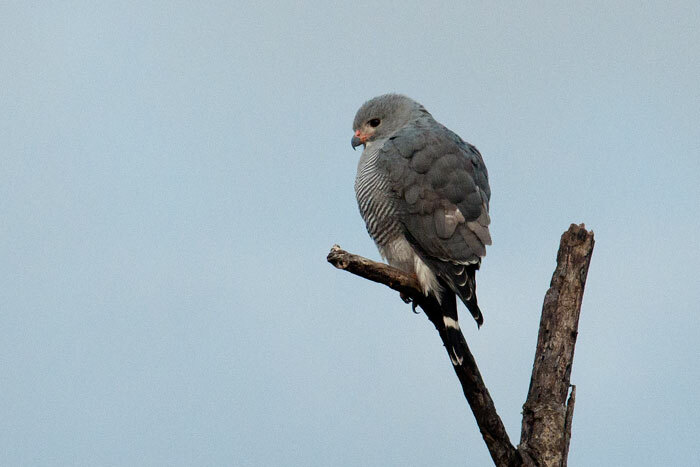 A lizard buzzard watches for prey beneath. 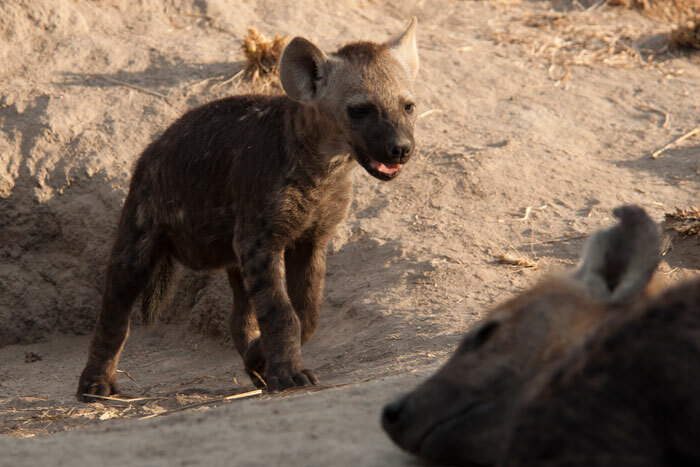 A hyena cub comes out the den towards its mother. They are becoming so brave and curious. 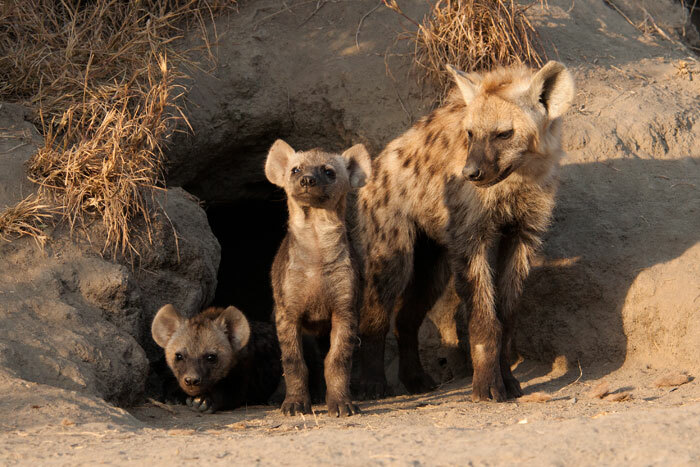 During one visit to the den site this week, the youngsters even came out without the mother present. Two cubs and one sub-adult emerge, smelling the morning air. 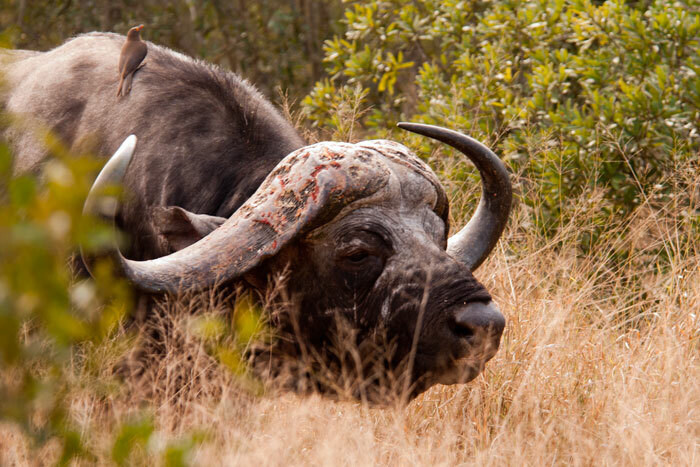 We came across this buffalo bull with the longest horns we have ever seen! A rare bird for our area. 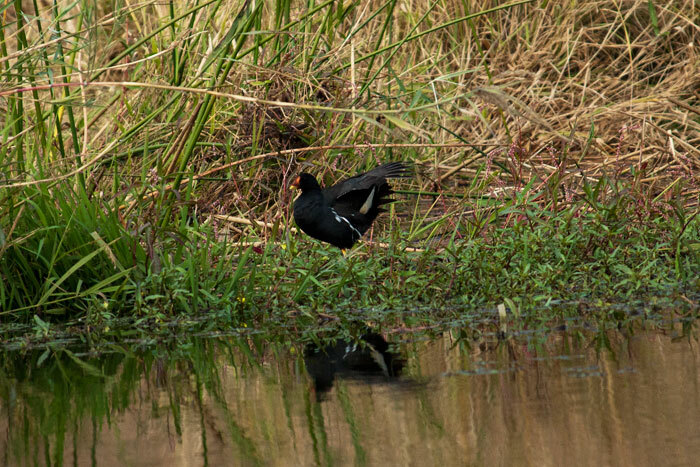 A moorhen has become resident at Camp Dam! 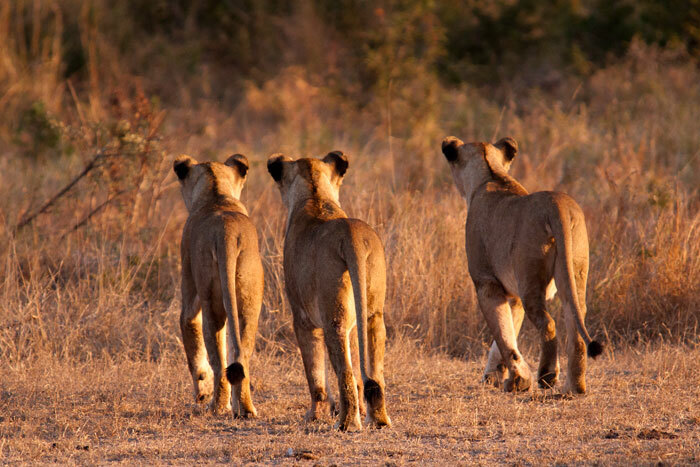 Three of the four Tsalala lionesses hunt a nearby kudu. 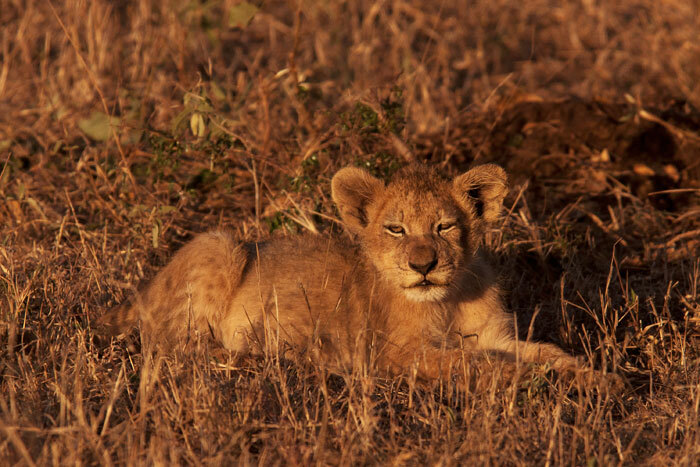 They were not successful – but these girls have been taught to hunt during the day by their mother, the Tailless Female. 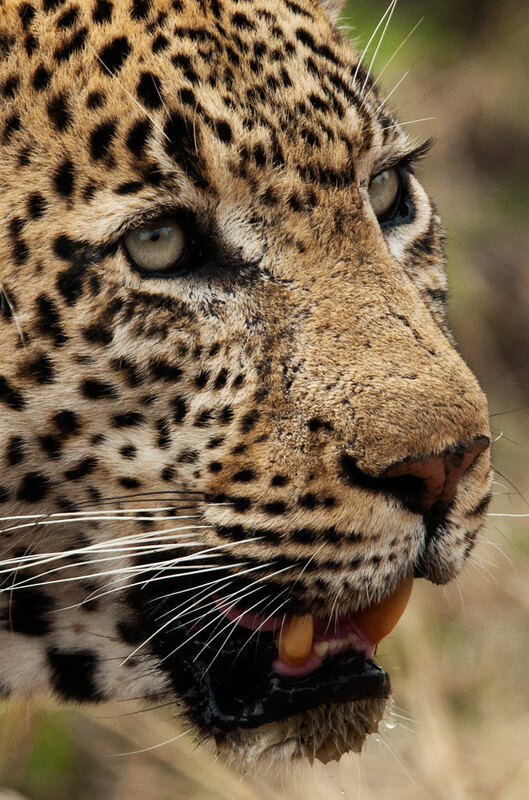 One of the Majingalane Males looks on as the lionesses hunt. 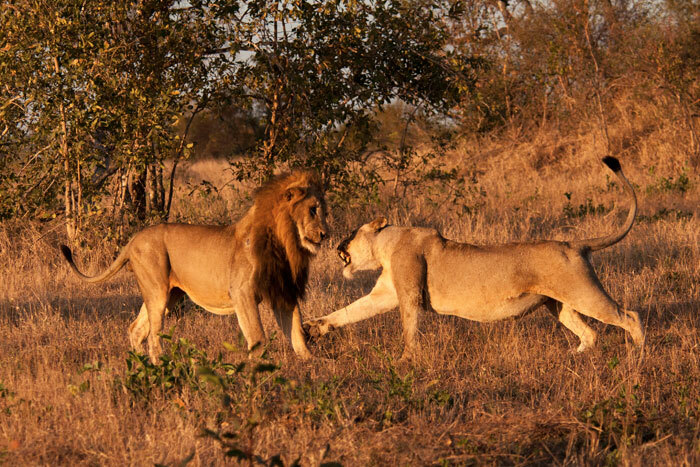 Male lions sometimes get a bad rap for ‘not doing any hunting’ and reaping the benefits of the females’ work, but this is untrue. The Majingalane Males are excellent hunters and hunt often. 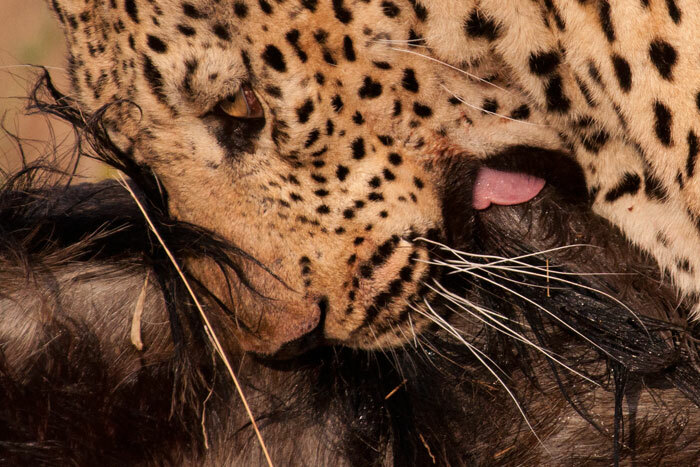 However, in my experience, females are less likely to be spotted by prey because of the absence of the big mane, so it is more beneficial for the males to let the females do the work when the males and females are together. 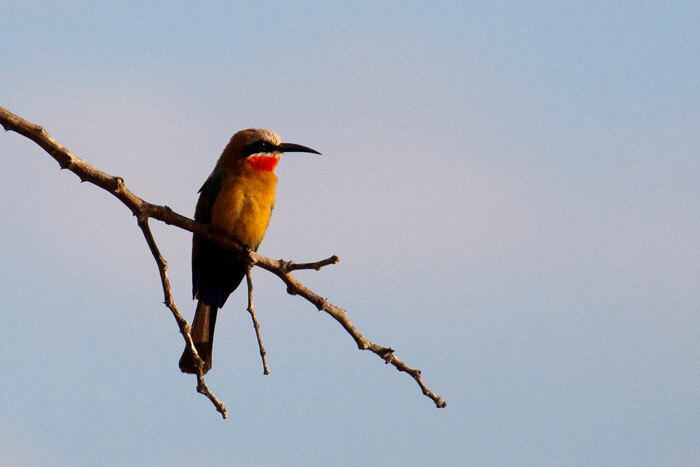 A White fronted bee eater perches near Tree Camp deck. 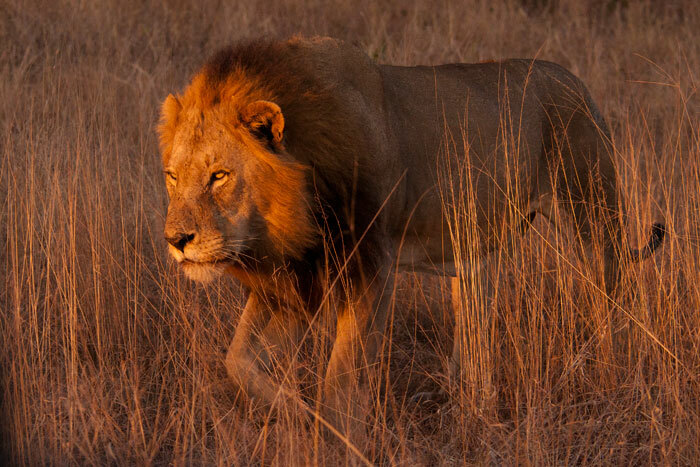 One of the Majingalane Males – the one with the scar on his hip – searches for his brothers in the morning light. When we found him he had been calling, and listening for any response. We followed him until we heard the growls of his brothers, along with the Sparta Pride, feeding on a wildebeest they had killed! 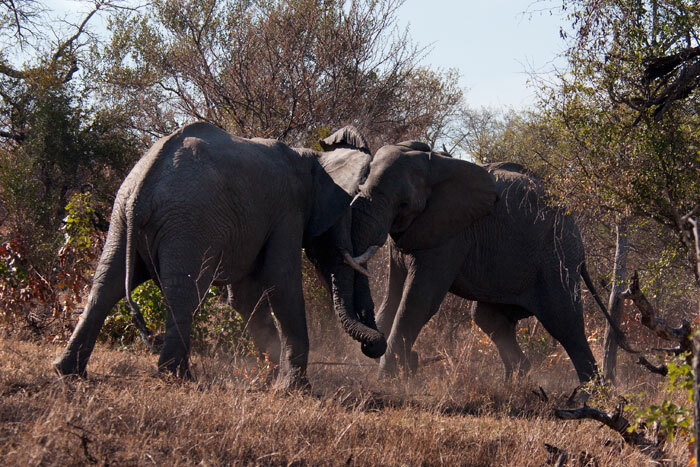 Hip Scar clearly wasn’t welcome at the carcass – his brothers chased him off. 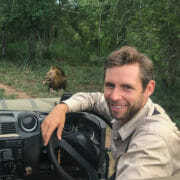 So instead he tried his luck with a nearby lioness, who also didn’t appreciate his company! 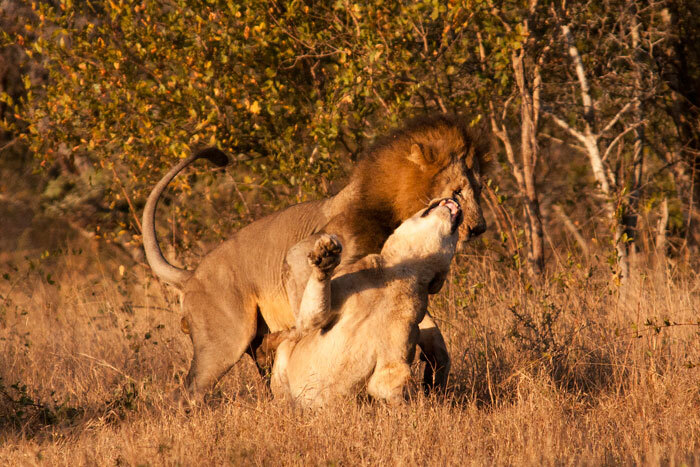 Upon seeing this, the Dark Maned brother left the kill and chased after Hip Scar to win back ‘his’ lioness. They then mated (they would stay together for 3 days) while Hip Scar got to eat. 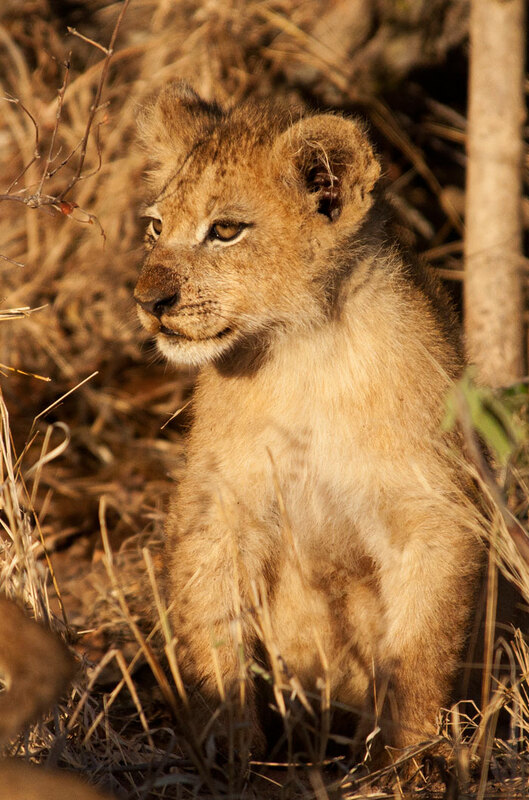 The cubs were all present – the three younger cubs and the one remaining orphan. They were quite full and tired! They all fed together eventually. It was lovely to see the little ones again after last week’s tragedy with the Tsalala Pride. A young hippo plays in the water. Our latest star is still around! 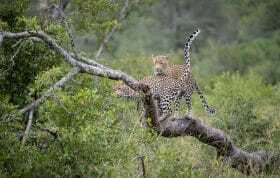 The young male cheetah gets a good view from a fallen marula tree. We followed him one afternoon and watched as he searched for prey, but played along the way. Here he was chewing the roots of a fallen knobthorn tree. 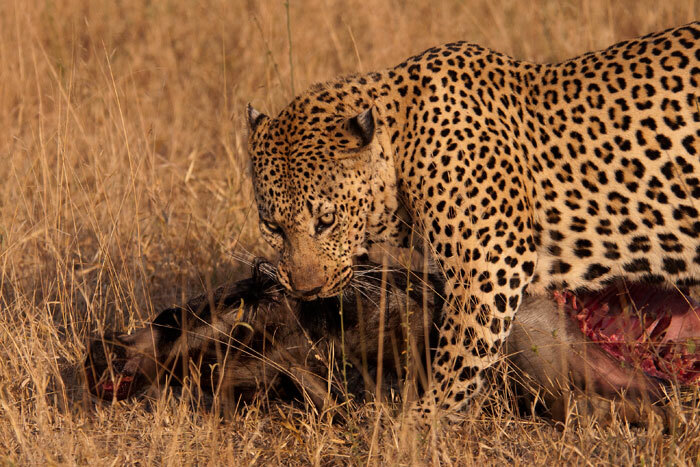 In the past week he has been able to secure and finish two kills that we know 0f – an impala and a steenbok. Clearly his tendency to climb the fallen trees for a vantage point when hunting is working! A Bataleur eagle follows the movements of the cheetah below. These birds will sometimes follow predators hoping they will make a kill. 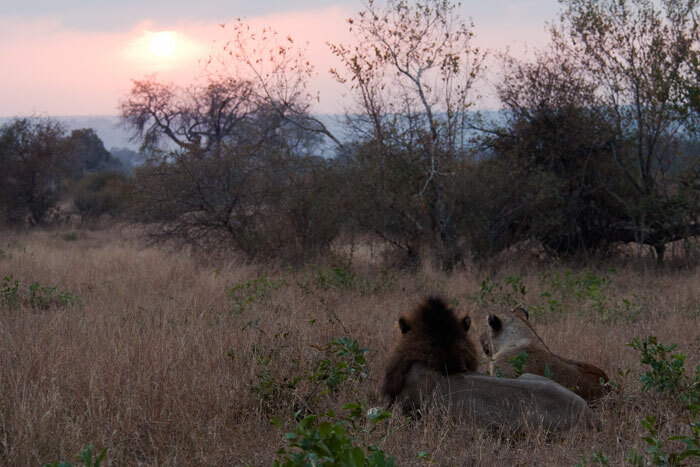 The mating pair of lions seems to watch the sunrise. 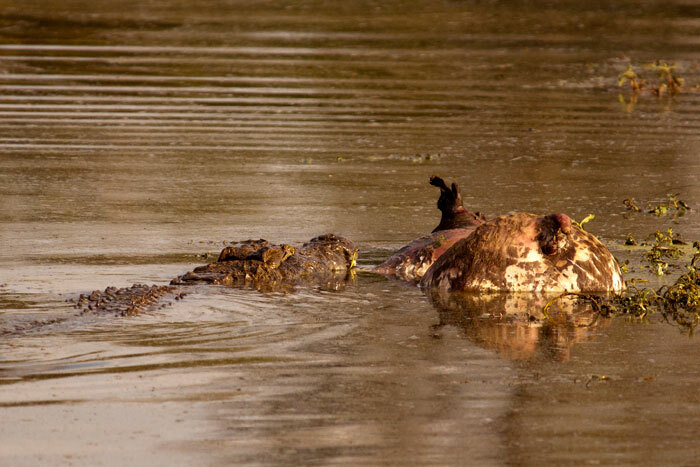 A crocodile swims with a buffalo carcass in Maddie’s Dam. It must have killed the young calf when the herd stopped there for a drink about five days previously. These fearsome predators can take very large animals because of their ability to lock their jaws and drown their prey. 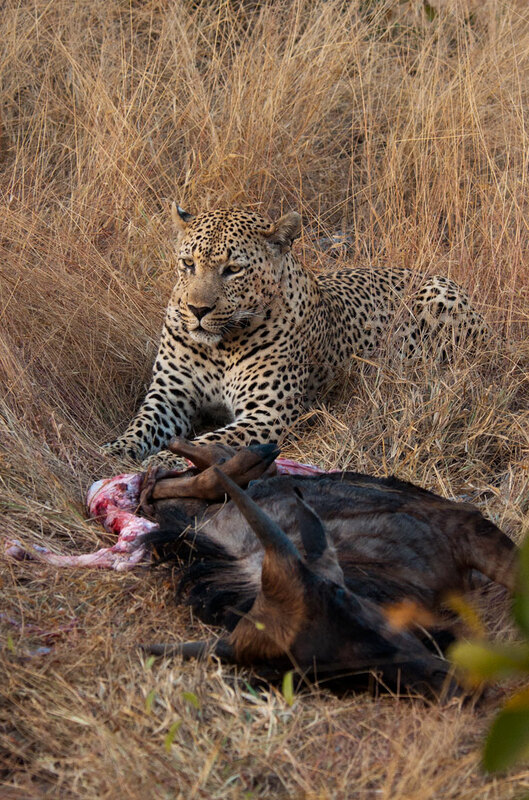 The Camp Pan Male stands guard over his wildebeest kill. 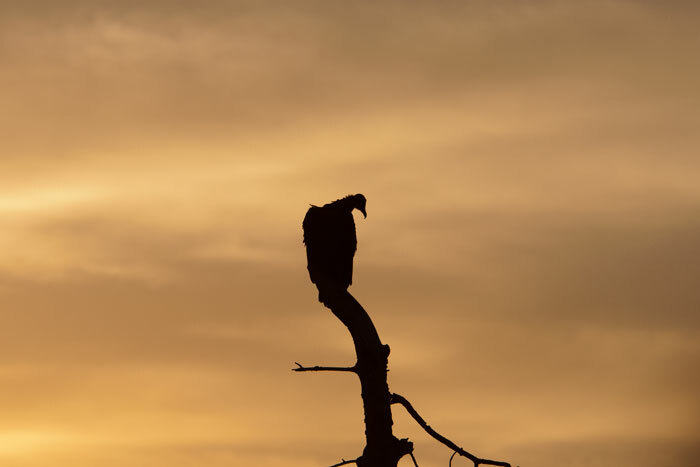 A hooded vulture waits nearby, silhouetted by the sunrise. 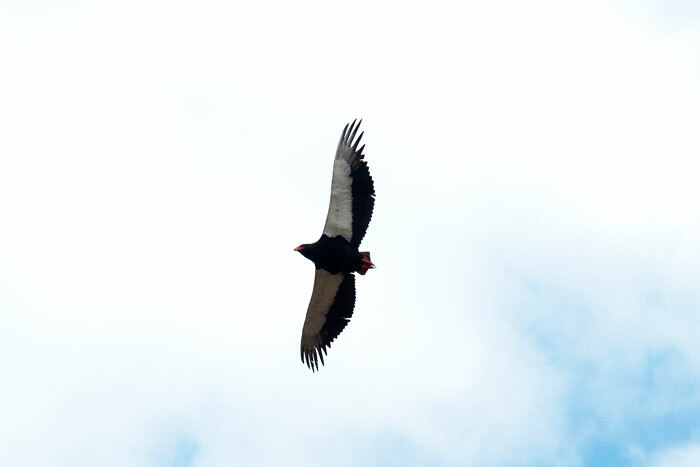 This was a concern for Camp Pan, as there were lions nearby who may have been attracted to the area because of the vultures. He dragged the carcass to a nearby tree and began feeding. 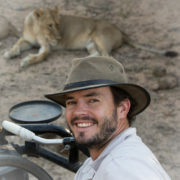 It was too heavy for him to hoist in any tree nearby, but in any case would have certainly attracted the lions. 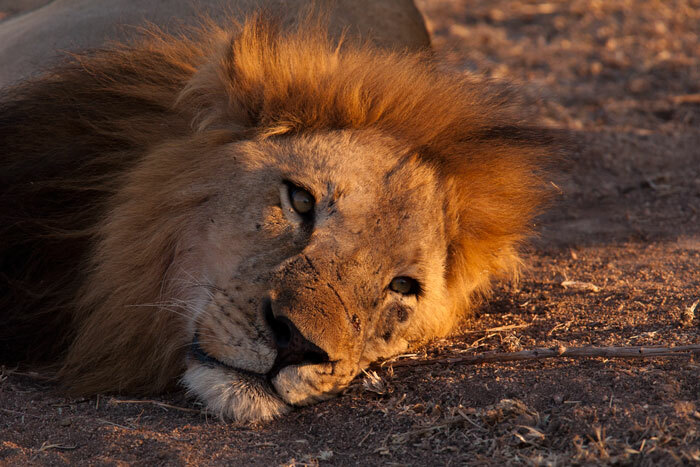 Once the day warmed and the other predators presumably not lurking, he decided to take it across a clearing, far from the lions and into a thicket. 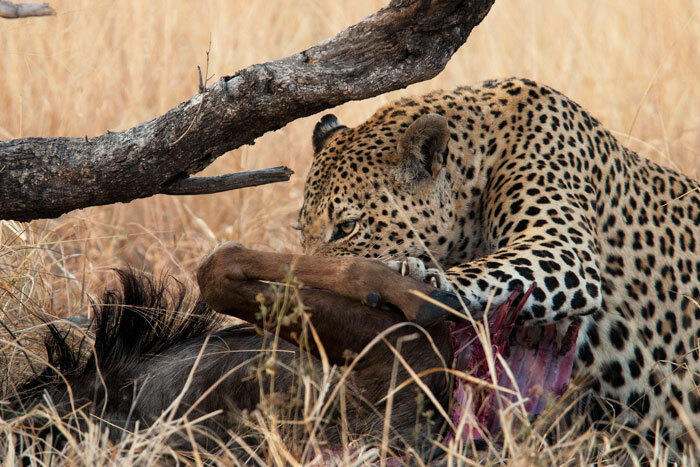 A wildebeest kill is very impressive for a leopard, and he seemed determined to keep it until it was finished! He dragged it about 150m, stopping frequently to catch his breath. 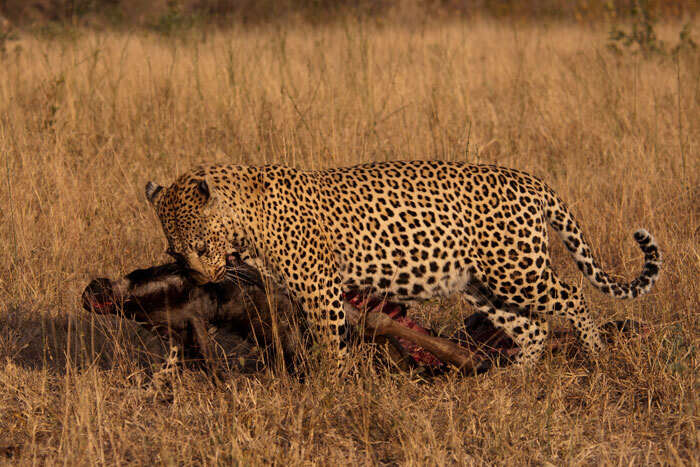 The power involved in dragging such heavy weights is unique to the leopard. Despite his already full belly, he managed to take the carcass to safety and feed on it for the next day. The sunrise from the new Founder’s Deck is worth delaying the morning drive an extra five minutes! Talley! These shots of the winter sunrise are breathtaking! I’m coming right back!!! Spectacular lighting on all the photos! Beautiful pictures this week! Thanks! 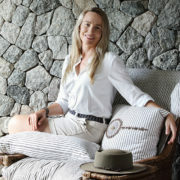 Great pics Talley, good to see Camp Pan looking in such good condition!! Fabulous!! Thank you so much for allowing us to still feel like we are there! 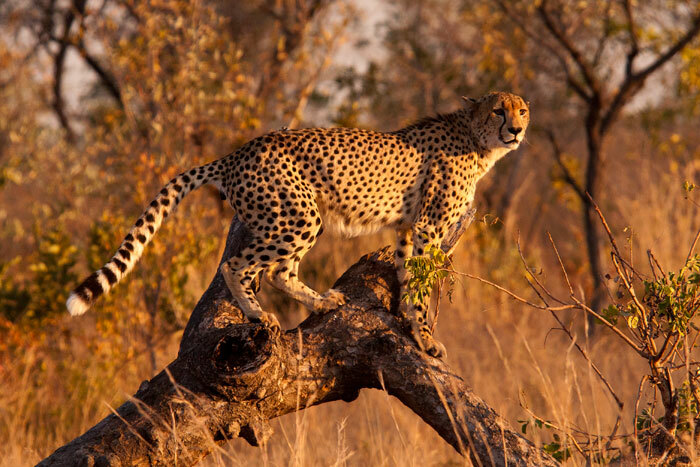 The pictures of the Cheetah are amazing. Spectacular views, spectacular animals. Thanks for sharing another amazing week. 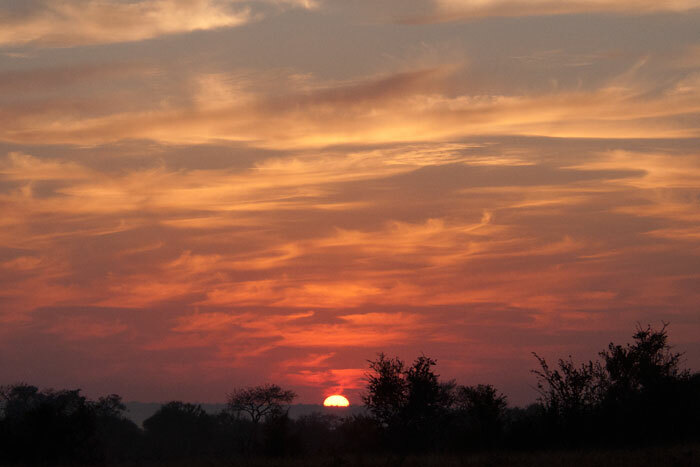 The pictures are wonderful…enjoyed them all, especially the ones of the sunrise. Marvalous pictures, and a good story of the week. Thank you so much for the update. Thanks so much, I feel as though I have been to Londo this week (while being in Sydney!). Wow, what a wonderful week. 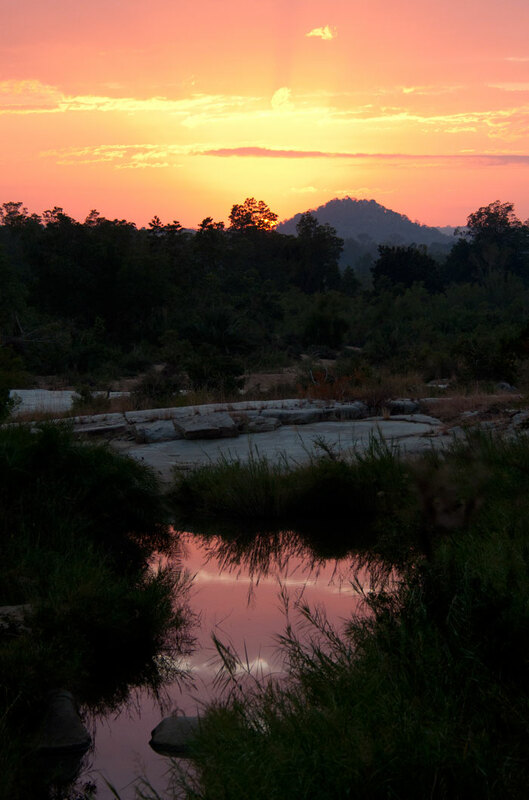 I know now that winter is exceptional in the bush – the lighting so special. Thanks for the treat, your photos are exceptional! dYou have out done yourself this week Talley! Thank you so much for all the fantastic pictures and commentary! As always, my gratitude for posting your weekly pictures. Each week, I’m imagining sitting quietly in the truck enjoying these very sites myself! Thank you Talley, best to Freddy. Wonderful photos and comments. Cheetah sightings wow! The sunrise was breathtaking! HI TALLEY, THANKS FOR THE MAGNIFICENT PICTURES. 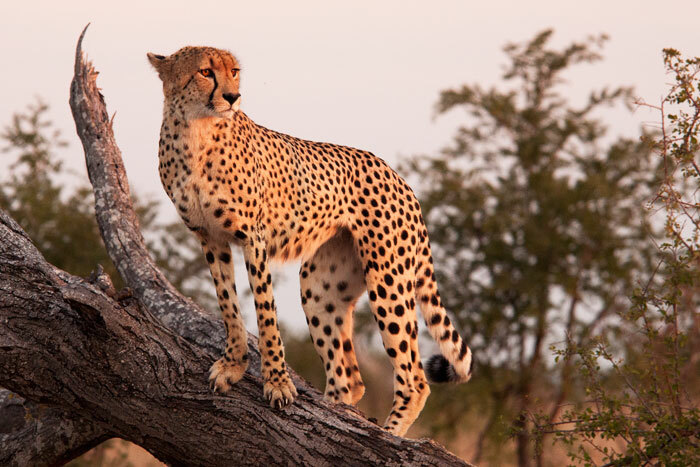 IT IS GOOD TO SEE THAT THE CHEETAH HAS DECIDED TO STAY ON LONDOLOZI! 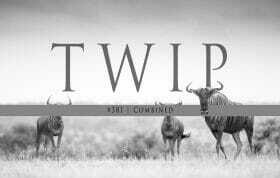 THE SHOTS OF CAMP PAN ARE REALLY SPECIAL WITH THE WILDEBEEST KILL! WELL DONE AND THANKS FOR SHARING THEM WITH US. I AM LOOKING FORWARD TO MY NEXT VISIT IN SEPTEMBER. Amazing pics Talley! Some of these look really familiar! Those three days with you really reaped rewards!